To continually improve upon our level of customer service, Total Marine Solutions has developed an online database where customers have immediate and constant access to the Verification Certificates, Service Reports and Archive Analysis relating to their fleet. 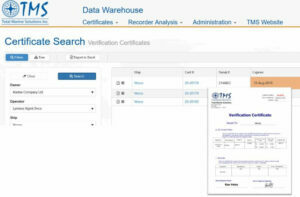 TMS Data Warehouse also services as an inventory control and verification status tool for users both shipboard and shoreside. This user friendly tool is available as a value added service to participants of our verification program as well as part of an annual subscription service with Total Marine Solutions.